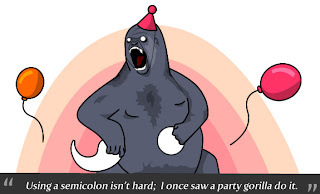 English courses with Twin: English Punctuation! You probably use simple punctuation, such as full stops, commas and question marks, on a daily basis, both when writing and when speaking. However, here is some sophisticated punctuation that, if used in your writing, makes it very professional and of a high standard. The meal was good: they ate salad, roast chicken, cake and fruit. Portsmouth in the South; and Cromer, Norwich and Lincoln in the East. George Washington (the first president of the United States) gave his farewell address in 1796. Actress/model Elizabeth Hurley was at the awards show. Many years passed… still she remained ill.
We hope this was useful and that you are able to use some of these forms of punctuation in your writing. We’d love to hear from you, so leave us a comment to tell us whether you found this useful. You can even show us an example of your punctuation practice! If you're interested in learning English in the UK, please visit our website to find out more about Twin English Centres.